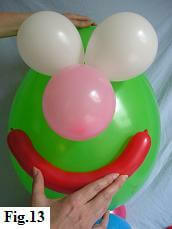 Your funny balloon face is starting to come alive. All it needs now is a mouth, eyes and perhaps some hair! To go over Part I again, please click here. 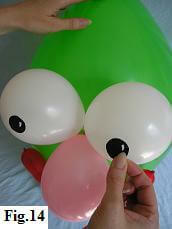 Blow up two white 5" balloons for the eyes and with the knots pointing down and towards the nose find the best position for them. 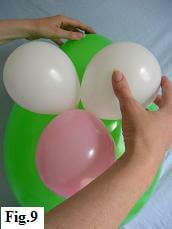 Once again, put two little blobs of glue there and attach the balloons (fig. 9). Now let's give him a big cheeky grin! 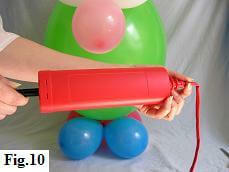 Using a balloon pump inflate one of the twisting balloons (fig. 10). 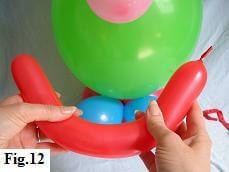 You only need about 30cm for the mouth, so from the end of the balloon, twist it a couple of times at this length. Then pinch it at this point between your fingers, let the neck end deflate and snip it off with your scissors. 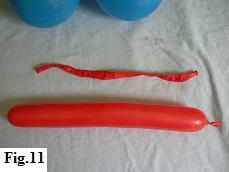 Finally knot the balloon and you should be left with what looks like a large hot dog sausage (fig. 11). O.K., he's grinning and staring right back at you, but maybe he looks a bit thin on top! So, let's give him a few strands of hair. 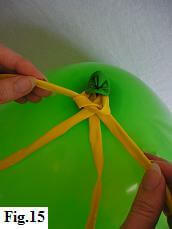 To do this, take two twisting balloons and tie them in the middle around the knot on the top of his head (fig. 15). 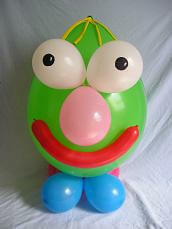 And there you have one big happy balloon face, ready to help bring some huge smiles to many little faces!